Pluqis Laminating Pouches offers the best protection to documents that you handle frequently. 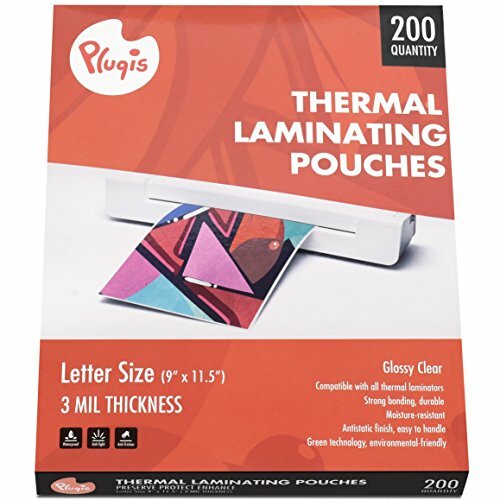 These 200-pack, 3 mil thick thermal laminating pouches are compatible with virtually any thermal laminators in the market today. Pouches are clear to let important information show through. Letter size for documents up to 8.5 x 11-Inch. Now with new packaging design with the same superior quality. NEW DESIGN, PREMIUM QUALITY - Perfect to use with ANY thermal laminators in the market with satisfying result; just slide-seal-and-forget with your preferred laminators; now with new design! PROTECT AND PRESERVE IMPORTANT DOCUMENTS - Pluqis laminating pouches offers long-lasting protection to all of your important documents, such as diploma, presentation materials, photos and so much more. PHOTO SAFE - All Pluqis laminating pouches are safe to use with photos. Protect your family and special occasion memory, be it in scrapbooks or albums, and enjoy them for years to come. PERFECT FOR EVERY PROJECT - Ideal to use for your general projects, such as creating dry-erase worksheets, maps, or signs for students to preserving instructions and artwork, and so much more! If you have any questions about this product by Pluqis, contact us by completing and submitting the form below. If you are looking for a specif part number, please include it with your message.